E3 Highlights: Final Fantasy XV Gameplay Trailer & Kindgom Hearts III! The 2013 Electronic Entertainment Expo is being held this week in LA! The lucky souls at this year’s E3 at the Los Angeles Convention Center are getting a glimpse at the future of gaming. With next-gen consoles like the PS4 and Xbox One both launching in Q4 2013, there’s a lot to look forward to over the next couple months! Among the slew of next-gen games coming to both new systems, SquareEnix has announced a new installment in its flagship Final Fantasy series. 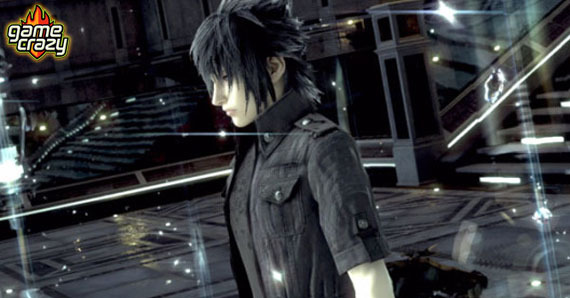 Final Fantasy XV (or FF15, if you’re looking for an abbreviation) will take place in a similar world to Final Fantasy XIII and focus once again on a story of Crystals and the power struggles to control them and thus the world. FF15 was originally set for release on Playstation 3, but will now be coming to PS4 and Xbox One both! A brand new gameplay trailer has made its way to the public from E3 and you can see it below! Did you see the Behemoth? Awesome. It looks like the gameplay for FF15 is taking some of the action elements from Square Enix’s blockbuster Kingdom Hearts series and blending it with Final Fantasy‘s long-running tradition of groundbreaking graphics and intricate storylines. Of course, we love some Kingdom Hearts as well, and if elements are bleeding into the realistic approach of FF15, that can’t possibly be a bad thing. The continuing saga of Sora, Goofy, Mickey, Donald Duck and all the rest will also receive a next gen installment, it looks like. Kingdom Hearts III was a rumor for a long time, but at E3, SqaureEnix confirmed it’s in development for Xbox One and PS4, and even unveiled a teaser video! Stay tuned for more from E3 2013! Grand Theft Auto V — Gameplay Footage! E3 Highlights: Showing off Batman: Arkham Origins E3 Highlights: Assassin’s Creed 4: Black Flag is Hypnotic The Witcher 3: Wild Hunt — New Trailer Tests Moral Code Here’s 9 Minutes of Metal Gear Solid V: The Phantom Pain! Get Ready To Sink Your Fangs Into Castlevania Lords of Shadow 2 SDCC 2013: Capcom Announces Strider Coming to PS4 and Xbox One! And the E3 winner is… Sony! This entry was posted in E3, Playstation, Xbox and tagged E3, E3 2013, final fantasy, final fantasy xv, Kingdom Hearts, kingdom hearts iii by summerm. Bookmark the permalink.